BOSTON Two bombs exploded near the crowded finish line of the Boston Marathon on Monday, killing three people and injuring more than 140 others in a terrifying scene of broken glass, smoke and severed limbs, authorities said. CBS Boston station WBZ-TV reports one of the three who died from the attack was an 8-year-old boy. Police reportedly set off at least one other explosive device with a water cannon. On Monday night, a federal law enforcement source told CBS News correspondent Bob Orr that an earlier report was incorrect that authorities had found one other device that was intact and had not been detonated. Orr reports that authorities are not in possession of such a device. CBS News senior correspondent John Miller reports that a Saudi national is being questioned by authorities. He was seen "acting suspiciously" running from the explosion, and a civilian chased him down and tackled him. He was turned over to Boston police and is being questioned by the FBI. He is being cooperative and denies any involvement. "This could mean a lot, or this could mean very little," Miller said. "It's too soon to call him a suspect." Miller reported earlier that authorities are also reviewing surveillance video that shows a man from behind carrying two backpacks near the site of the explosions. Authorities are not sure whether the subject in the video is linked to the blasts. Boston police say no suspect has been taken into custody. There was no word on the motive or who may have launched the attack, and authorities in Washington said there was no immediate claim of responsibility. An FBI official told CBS News that officials are going to sweep the entire length of the marathon to look for any additional devices or any evidence they may find. A third incident at the John F. Kennedy Library a few miles away and more than an hour later was initially believed to be another explosive device, but library and police officials later said it was an unrelated fire. No one was injured. Demi Clark, a runner from North Carolina who said she was the crossing finish line as the first blast went off, told CBSNews.comthat "blood was everywhere instantly." "Nobody knew what to do - after the second one went off we were like, 'the city's under attack,'" Clark said. As people wailed in agony, bloody spectators were carried to a medical tent that had been set up to care for fatigued runners. "They just started bringing people in with no limbs," said Tim Davey, of Richmond, Va. He said he and his wife, Lisa, tried to keep their children's eyes shielded from the gruesome scene. President Obama said the United States does not know "who did this or why" but vowed that whoever is responsible "will feel the full weight of justice." "We will find out who did this, and we will hold them accountable," Mr. Obama said. At a Monday night news conference, Massachusetts Gov. Deval Patrick told reporters that random checks of bags would be conducted on Boston's subway system, known locally at the T.
"The city of Boston will be open tomorrow, but it will not be business as usual," Patrick told reporters. James Minicucci, who was arriving in Boston by car to meet friends at the finish line when the explosions happened, told CBSNews.comthat the scene was "chaotic." "Some guy told us it was really bad, that several people lost their legs, there were amputations and not to go through to finish line area," Minicucci said. Some 27,000 runners took part in the 26.2-mile race, one of the world's premier marathons and one of Boston's biggest annual events. According to BuzzFeed, 17,584 finished before it was cancelled at 2:57p.m. Boston Police Commissioner Edward Davis asked people to stay indoors or go back to their hotel rooms and avoid crowds as bomb squads checked parcels and bags left along the race route. Julia Morawoski, who was about 10 meters from the second explosion, told CBSNews.com that many spectators didn't panic until the second blast. "We all started to push the barriers down to get onto the middle of the street," she said. "People were trying to get away from the buildings - they were scared a third one was going to come. And when I turned around I could just see bloody bodies on the street, right near where we were standing." WBZ-TV reports one blast blew out the windows of a Marathon Sports store on Boylston Street. 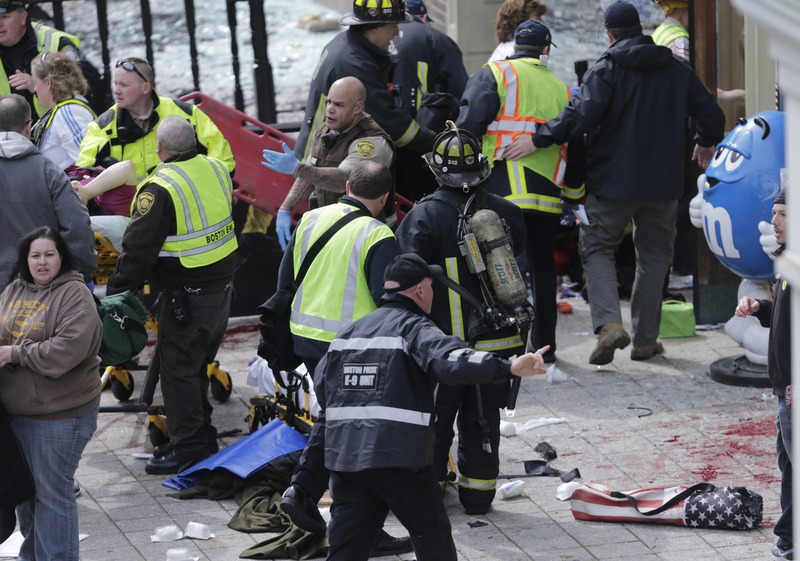 The Boston Police Department said three people were killed. Hospitals reported at least 144 injured, at least 15 of them critically. Boston Children's Hospital told CBS News that they are treating 10 patients, including a 2-year-old-boy with a head injury and a 9-year-old girl with leg trauma. The race also observed a moment of silence that lasted 26 seconds before the blasts struck hours later.